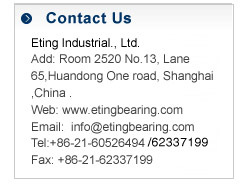 Eting Industrial., Ltd is founded in 1999, which is committed in reselling of famous brand bearings, such as FAG, NTN, INA, TIMKEN, NSK, NACHI, KOYO, IKO and other famous brands. With profound experiences and competitive price, we have won a great claim at home and abroad. Our main products include: ball bearings, deep groove ball bearings, self-aligning ball bearings, angular contact ball bearings, cylindrical roller bearing, tapered roller bearings, thrust ball bearings, thrust roller bearings, needle bearings, spherical bearings, joint bearings, pillow blocks, linear bearings, etc. Our products are mainly exported to Europe, America , Middleeast, Southeast Asia , Singapore , South Korea and other countries all over the world. With a large quantity of products in stock, we'll ship the products efficiently on the shortest notice so as to solve your mating problem timely. We also have further improved the network service, modified our website and enhanced our team spirit. In addition, we have reliable quality and quantity products to provide. We implement the win-win principle and fulfill " the best quality, the best credit " to provide superior service.